inTAXI 2.0. is designed to be flexible and support business growth. The inTAXI team are always developing our leading technology to ensure that our product remains at the forefront of industry technological advances. With over 10 years’ experience in the taxi and software industries, inTAXi 2.0. was built for taxi people. The application is multilingual and is unique for all cities or countries in which the user is located, and in which at least one taxi service has implemented inTaxi system. The user has the option to choose the specific taxi service if more taxi services in the same city use inTaxi 2.0 system. Flexible trip dispatching to closest vehicle, vehicle in zones and trip bidding by drivers. Special rush hour rules with trip prioritization. Customer and principal trip invoicing. Entrepreneur trip and contribution invoicing. Statistic and revenue reports. Realtime system monitoring: trip violation monitoring, vehicle status/location/panic alarm monitoring. Driver communication (call requests, text messaging, ...). User friendly android based app. Automatic trip projection and synchronization with BCT. Integration with peripherals (NFC, QR code, BT printer, taximeter, panic alarm button, camera, POS,...). Smartphone app and web portal for customers (and principals). Trip booking and invoicing. Credit card payment. Managing static routes for group transport trips (fixed/reoccurring). Easy route update in case of ad hoc changes. 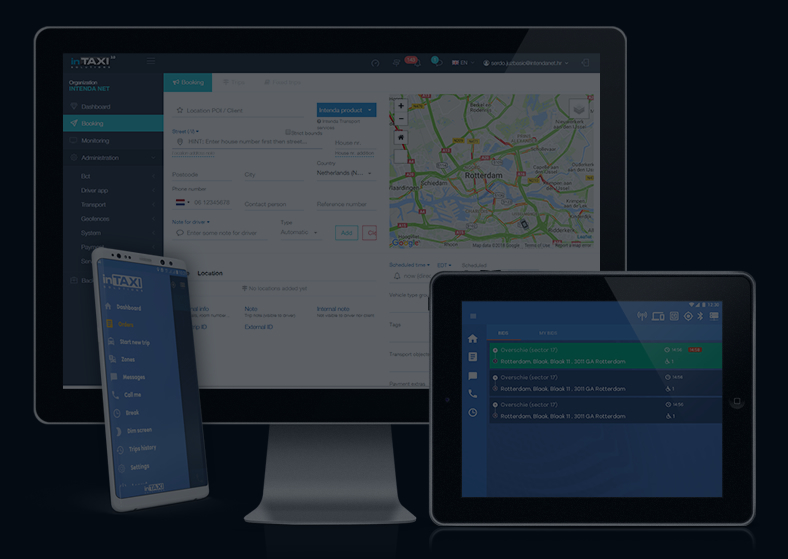 Completely automized and fast realtime group transport trip planner. Support for continues planning (time window based trip batching) and realtime planning (constant trip re-planning). Realtime planning violation monitoring and tuning. Entrepreneur fleet management (drivers, vehicles, shifts...). Trip and contribution invoicing. Statistic reports. Automatization of sending/receiving trips from other taxi/group transport companies via software integration. Invoice export and customer data import. © Copyright 2018 inTAXI solutions. All rights reserved.